We identified the behaviour of the application for each gesture. 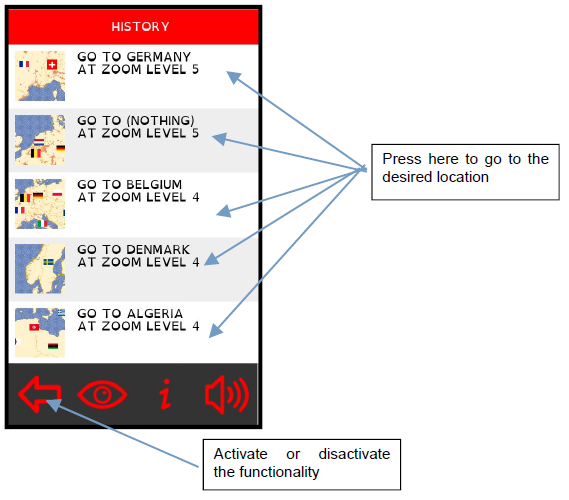 The location history functionality allows the user to recognize the path followed to reach the location he is currently looking at. When the user presses (long press) one of the entry the user is guided to that location. A message on the notification area informs the user about the behaviour. 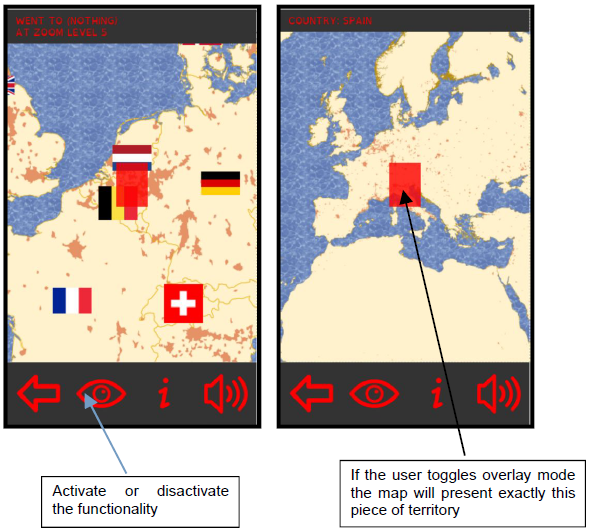 The overlay mode allows the user to recognize what is around the location he is watching. Once recognized he can restore the previous visualization simply pressing the overlay button. 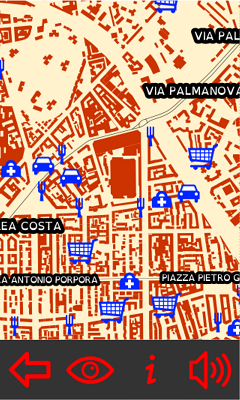 This functionality can be used to navigate quickly from a place to another. 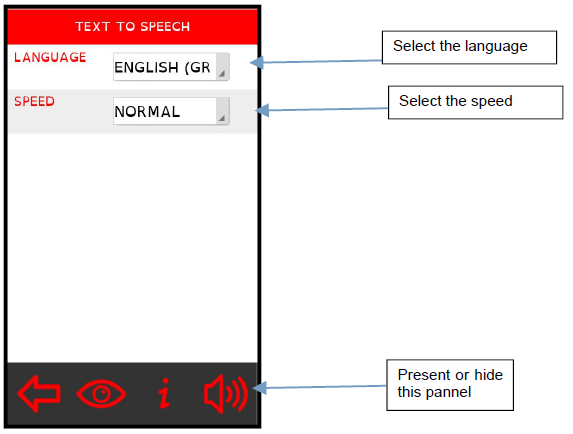 The text2speech capability relyies on the android native capability to syntetize speech from text. The use has to install the desired language on its device before using this functionality. We think this is not a limitation because the text2speech capability is free of charge, and there are voices for many languages. The only operation the user has to do in do download the desired voice from google servers. 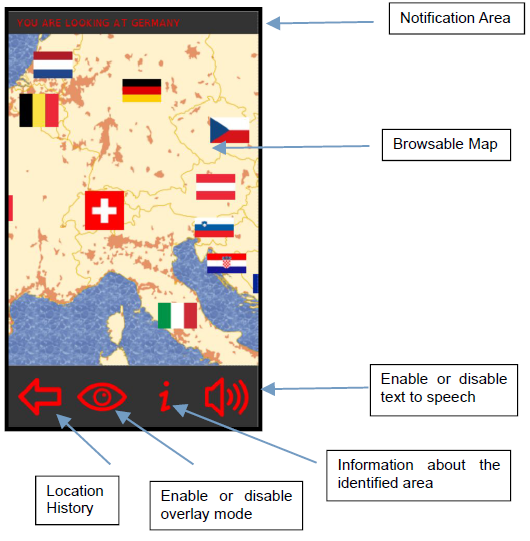 Once the user identified a location, a notification appear in the notification area. After that he can know more about the location, pressing the informations button. The maximum number of features present is three to avoid crowding. 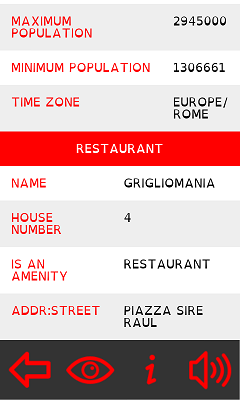 Features presented follows the rule “from generic to particular” and an information about the context is always returned (if present in original data) . 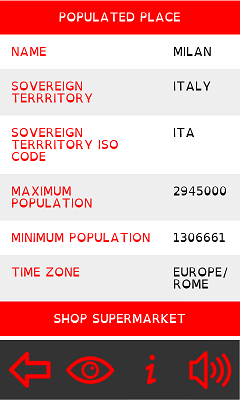 All the alphanumeric information are spaced and distinguised. 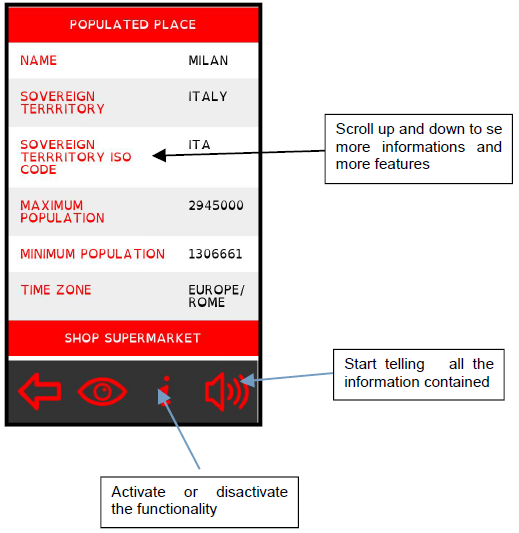 A press on the text2speech capability makes the application start to tell all the information contained on the screen. If text2speech is not configured, if the user presses the text2speec button the application will show the text to speech configuration page.